If you look real close, to the far right, you can see two short bollards in front of the doors at this 7-Eleven in the University City community of Charlotte, North Carolina. Two thoughts about this: (a) Uh, way to go 7-Eleven...sort of. A little bit of protection is better than none, all things considered. 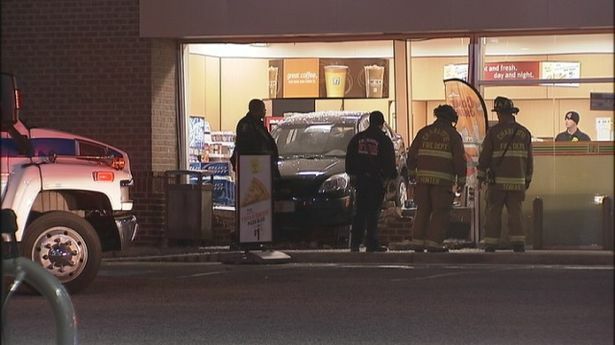 (b) Unfortunately, two lonely little bollards do not prevent cars in other spaces across the storefront from wreaking havoc...as you can see in this February 1, 2013, accident photo from WSOC-TV. In this instance, the driver reportedly had the transmission in reverse when he accidentally hit the gas instead of the brake. The Whole Building Design Guide offers a valuable and impartial primer on bollards — both the vehicle resistant type and others. It's author, Dr. Charles Oakes, has been a helpful and supportive expert resource in my past conversations with him. Installing bollards is a great step, but there are other strategies for protecting storefronts as well. See our past posts and photos on best practices for such examples.